Need to take the hassle out of watering the lawn? Then having a sprinkler system installed from Giving Hope Lawn Management is the right choice for you. 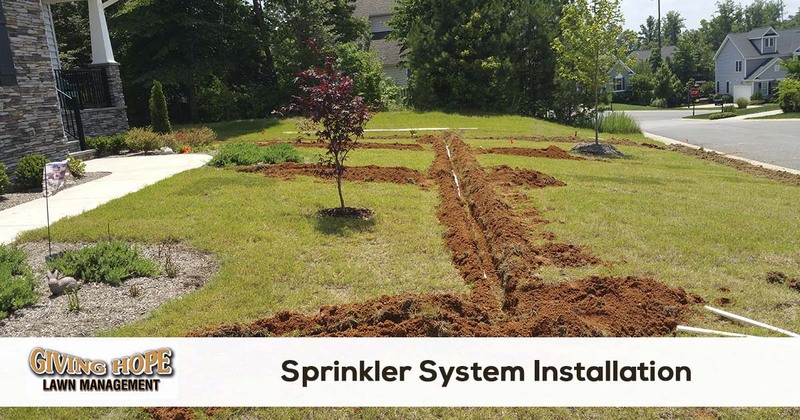 We offer sprinkler system design, installation and maintenance services. When it comes to maintaining your yard, you likely concern yourself mostly with plant overgrowth and chasing away bugs. But what about your lawn’s sprinkler system? If you’re like many, you probably don’t give your yard sprinklers any mind until they run into trouble. Busted sprinkler heads and leaking lines all take away from your plants’ watering needs! But better lawn irrigation comes from quality sprinkler system installation. When done correctly, your sprinklers can last a long time to come! For the best in complete irrigation system installation options, you can always depend on Giving Hope Lawn Management for the quality services. Since 2011, we’ve helped more businesses and residents achieve their perfect yards for less! Call today for your best irrigation system contractor. No matter your concerns or maintenance budget, we have the ideal solution for you! Shopping around for a service provider to install irrigation systems may get tricky. Some homeowners recommend going through a landscaping service, while others would rely on a plumbing company. However, in both situations, you may not receive the service you require. Many companies merely subcontract the job out, and they may not even have that much experience! Instead, we’ve remained the affordable solution for more Richmond, VA, yards. Whether you need help keeping your home’s lawn green or better curb appeal for your business, we are here for you! Call us for reliable sprinkler system installations. We guarantee better yards for longer every time! If your property has never had a sprinkler system installed, then you need a professional for the initial process. While many components included in your irrigation system are simple enough to learn, the first trenching is the most crucial. You need to know that your watering lines will maintain an even flow of water. But that only occurs if the system gets installed correctly. Many companies offer sprinkler repairs, but they may not know how to set it up from the get-go correctly. Instead, we offer affordable pricing and the peace of mind that it will last! Don’t trust your sprinkler installations to just anyone. Make sure you hire your local irrigation experts! An improper irrigation install will only cause expensive problems later. Instead, you need quality installations at affordable pricing every day. Choose the team that more area businesses and homes trust for quality installations for your new sprinklers. Call Giving Hope Lawn Management today and save on your best irrigation! If you are ready to have a new sprinkler system installed on your property, give us a call or request your free online.